Words are interconnected in fascinating ways, and unraveling these connections is a great way to build vocabulary. Rather than studying words one at a time, it’s much more efficient and interesting to learn them by family. The roots are the key! 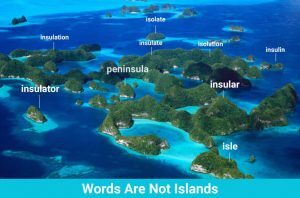 For example, the Latin word for island is insula, and it gives us: isle, insular, insulin, insulate, insulator, insulation, isolate, isolation, and peninsula, among others. Let’s take a look at some of these. …he had lived the life of a sated aristocrat; he had a fine pride in himself, was even a trifle egotistical, as country gentlemen sometimes become because of their insular situation. Insulin is a hormone produced in the pancreatic islets. An islet is a small island, or anatomically, a portion of tissue structurally distinct from surrounding tissues. Insulate and isolate also relate to island nicely, but what about peninsula? To unwrap this one, we need to analyze the root pen: “almost, scarcely; lack, want.” Yes, a peninsula is “almost an island”, but not quite. While we’re here, let’s check out some other words with the root pen: penultimate, penumbra, and penury. Similar to peninsula, penultimate means “almost the end, next-to-last.” A penumbra is an area that is “almost fully shaded, or is almost fully in the shadow of an opaque object.” Again, it’s the idea of “not quite.” In astronomy, we speak of the shadow cast by the earth or moon over an area experiencing a partial eclipse, as in: During the eclipse, the moon slipped into the earth’s penumbra. On the whole island there were but three miserable huts, and one of these was vacant when I arrived. This I hired. It contained but two rooms, and these exhibited all the squalidness of the most miserable penury. Word roots are the keys that unlock meanings. What’s more, they help students build word curiosity, make connections, and think critically!